Graphics panels for shell schemes provide visual impact that improves your presence at any exhibition. The key is how the shell scheme graphics are attached and how to create a professional feel to your shell scheme interior. When booking exhibition stands at a venue there are usually two types available to you: ‘shell scheme’ or ‘space only’ exhibition stands. Shell scheme stands are usually built using an aluminium system such as Octanorm, Modul or Sodem. This system framework is then infilled with plain white rigid PVC foam sheet. Your shell scheme will usually come with a carpet, a power socket and lighting. Some organisers will also provide a furniture package. A space only stand is literally just that. 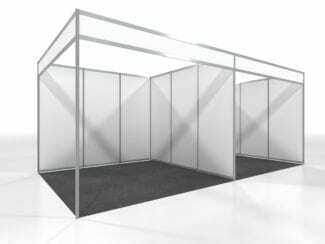 You will need to provide everything yourself or engage the services of an exhibition stand design and build company to take care of everything for you. The benefit of shell scheme stands is that you don’t need to spend loads of money creating your own stand or engaging a stand contractor to do it for you. The downside is that a basic shell scheme will look exactly the same as everyone else’s. So you’ve chosen to book your shell scheme and you have decided that it’s best to maximise your presence and stand out from the crowd. To achieve this we strongly recommend that you do not turn up with print posters, Blu-Tack or Sellotape. Even if the posters manage to stay up for the duration of the trade show or event, the image this solution portrays is not a professional one. As the saying goes, you only get one chance to make a first impression. Let’s look at some options to help you achieve this. Years ago there was a tendency to use printed shell scheme graphics panels and double-sided tape them directly to the shell scheme panels. Unfortunately this would leave the aluminium uprights of the system visible. Other solutions, such as the shell clad system, were developed but these would still leave visible join. These solutions were not ideal and would not transfer between differing types of shell systems. Further shell scheme stand graphics solutions, including pop-up display systems and banner stands had their place and would provide a portable and reusable solution. The downside of these types of freestanding display is that they would take up valuable floor space and would also look ‘plonked on’. Nowadays shell scheme cladding is all about seamless shell scheme graphics. With today’s high quality printing techniques and the development of new materials, it looks like these will be around for a while. 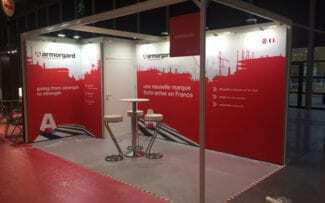 We have been providing exhibition shell scheme graphics for many years. Having worked with lots of different solutions we’ve stuck with just three or four that we feel provide the best results. To solve the issues mentioned above we use a lightweight framework that attaches to any aluminium system framework regardless of its profile or panel sizes. A high resolution fabric print is then tensioned into the frame to provide a stunning backdrop. Available from us on either a hire or sale basis, Tecna T3 is highly reusable and easy to transport, making this a perfect and cost effective self-build exhibition stand solution. 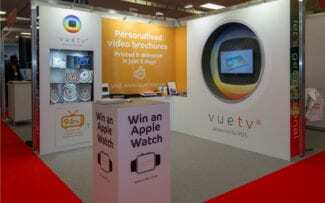 Cladding exhibition stands with seamless graphic walls can also be done using standard exhibition graphic panels. Covered in a lower cost printed PVC material this is an ideal shell scheme graphic solution for one off use. Another solution we provide to enhance your shell stand space is a custom modular display that will provide graphics and shelving displays for shell scheme stands. With a high quality paint finish as standard, the Colonnade system will give a custom built/bespoke exhibition stand feel to your space. To learn more about our custom modular solution click here. As a full service provider with our own extensively equipped production facilities we can also design and custom build a bespoke solution tailored to your specific needs. This can be anything from a simple TV display unit to a complex CNC-produced curved wall panel that organically curves around your stand space. Our experience in the manufacture of bespoke displays and modular exhibition systems will ensure your custom built shell scheme interior is reusable and unique. Whichever solution you choose you will be guaranteed perfect seamless graphics that enhance your exhibition space and maximise the impact on your potential clients. For a free no obligation design and quotation please call us now or send an email; we would love to hear from you.